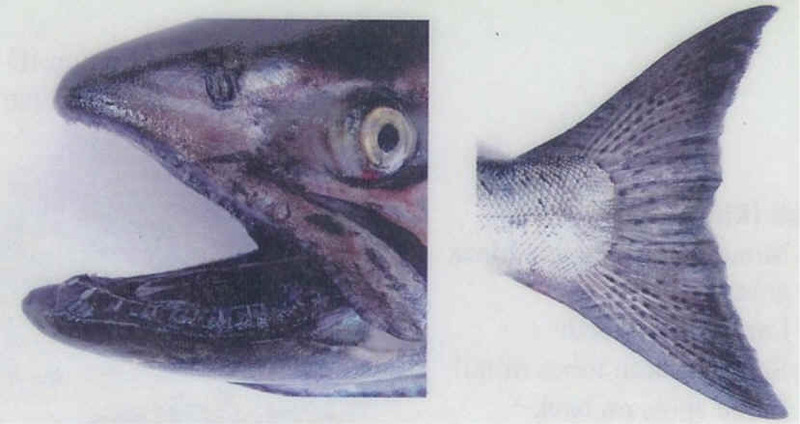 A Little History First ; The term Blackmouth in this case refers to a immature Chinook salmon. Since Chinook have a black gumline, the nickname Blackmouth has stuck. They are typically smaller fish (6# to 10# with a large one going 15#) than their ocean going cousins, in that there appears to be less bait in the Puget Sound year around, hence they do not normally grow as large. Plus they stay in the sound, so you get a mix of 2 year fish in with the 3 & 4 year fish, as compared to having a run return for spawning each year. Methods of Fishing ; The normal methods will be trolling with downriggers, mooching or jigging. I will not cover these methods in depth here unless there may be a major difference than in the normal methods, since I already have on other articles in this series. Where to Fish ; First, you need to fish where the fish are expected to be at at that particular time. That means, where is the bait? The Blackmouth will follow the food. The baitfish will try to not be in the main current, but in a protected area where there is less current. In Puget Sound, as with all impoundments still connected to the ocean, you will have a incoming & an outgoing tidal movement. To fish this type of situation effectively, you need to think like you are fishing TWO DIFFERENT RIVERS, depending on whether it is an outgoing tide, or an incoming tide. The baitfish will be in the lea side of a point or island, where the current is not as strong as compared to being in front of the same structure. Puget Sound is home to many spawning beds for herring and sand lance. These are both favorite food for Blackmouth. If you can locate the when and gravel; areas where these baitfish spawn, and fish that area with a lure that imitates them, your chances of success will raise considerably. Two of the better known of these are Mid Channel bank just off Port Townsend & Quartermaster Harbor on Vashon Island across from the Tacoma ferry terminal. Where you found the Blackmouth last week, may not be where they are at the same time today. Different Sections of the Sound Treated Differently ; The Straits may require slightly different methods than the southern sections of the sound. One thing to do is to talk to fishermen, (yes I know they don’t like to tell a lot), but you don’t have to ask real pertinent questions, but if they find out you are genuine, maybe they will give you some local information. Ask the bait shops, or better yet hire a local charter for a days learning session. When to Fish ; The WDFW will set different open season areas, with some closed at times. Therefore you need to read the current Fishing Regulations pamphlet. This may change yearly. But usually there are some locations that will be open year around. Boat ; In fishing the sound, the requirements for a larger seagoing type of a boat is not a concern. You can get by with a 16′ -18’er quite well. You however may have to watch the weather at certain times of the year, as some of the sound’s waters can become rough at times. Just practice safety and be prepared for emergencies. Downriggers ; When trolling with this method, it is advisable to find baitfish and fish just above them. That may not be possible all the time, so the next best is to troll ON THE BOTTOM. Many successful fisherpersons will troll a flasher using the ACE IN THE HOLE method, when it is working properly, the flasher while rotating, will bump the bottom at times, even to the point that the reflective glo-in-the-dark tape will be rubbed off. All this said, don’t overlook a school of baitfish at mid depth, and fish just under them. Remember that the salmon will follow the baitfish. Rods ; Most rods used will probably be in the 8′ 3″ to 8′ 6″ range. Some use a longer rod, being more sensitive with the idea is that they can tell a lot easier if there is a small, “shaker” fish has taken the bait, but not tripped the release clip. This allows them to retrieve this fish and release it instead of dragging it around, possibly drowning it. The rod’s power range (8#-17#) may be just a bit lighter than an average ocean salmon downrigger rod. Line ; here you will get many different points of view. Many fisherpersons here will use the braided spectra type lines in about a 30# test. You do no need a 30#, but if you go smaller the line may dig down into the rest of the line on the spool, making for possible “birds nests” plus the knots get harder to see/tie. One thought here is that you can see the rod tip change if you happen to have a “shaker” on that has not popped off the release clip easier than with monofilament line. If you are a monofilament line person, then line in the 15# range works OK also. Monofilament is less forgiving to in-experienced fisherpersons, as it has some stretch, equating somewhat to a bungie where they may well be able to bring a fish to the net, where if using spectra a fast move by the fish that the fisherperson does not anticipate, could result in a lost fish. Lures ; You can troll herring, but the most common lure will be a spoon or a squid. This can be a Les Davis Coyote spoon in green/chrome or army truck. In areas where candle fish are common then the Les Davis NeedleFish may be a better choice. Another good lure is the Grand Slam bucktail, which is like a squid, but made out of many nylon leader material. Squid or “Hoochies” to some are a plastic tube with split tails that imitate bait fish. The added Spi-N-Glo is for a vibrating/rotating attractor. Commercial salmon trolling plugs are also used effectively, although mostly by a limited number of fishermen, and the ones who do, try to keep it not well know. Mooching ; Mooching can be a very productive method if used in conjunction with a good sonar, where you can spot concentrations of fish. You may encounter certain areas where moochers usually will be fishing. If this is the case, if you happen to be a troller, it may be best to stay on the outskirts of them to keep harmony amongst the group. Jigging ; This method calls for a more of a concentration of fish than the mooching requirements, otherwise you are going a lot of casting into dead water. Fin Clipped Fish ; The goal is to have all of these fish fin clipped. When this happens, then we may see better seasons.